There’s an older one with religious texts, too. I remember trying to organize our bookshelf often as a child (because I had nothing to do). My technique had always been to arrange them according to size. Tallest first so the shorter books could lean on them for support. That and they look prettier that way. Of course, my collection is nowhere near yours but when it does grow (now they’re just piling up on one table while non-books occupy the actual shelf), I’d probably arrange them all by author, too. I find it difficult to part with old books. I just want to keep them all until I get to pass them on to my children and hopefully, my children’s children! I like the idea of making similar authors book-neighbors :) Also, organizational systems should go a little more three-dimensional to account for books with multiple themes. Charles, I love section #5. I have that same complete works of Shakespeare volume, also received as an award for English studies. And I love the idea of tucking keepsakes between the covers. Some day they’ll be discovered again, by you or your progeny. I enjoyed the essay, thanks. I’m sure I, too, have bibliomania, and probably information anxiety, hence I buy too many books. 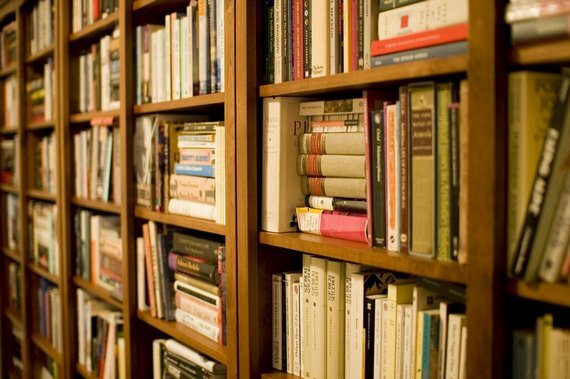 Organizing them can be enjoyable and satisfying, as the writer states, but if you buy them for twenty years without giving many away it gets to be a bit unwieldy, especially when changing residences. I’ve abandoned the practice and have pretty much randomized them, besides a rough intermittent size order. Instead, I keep a notebook, alphabetically, divided by fiction and nonfiction. I think this helps reduce the mania and anxiety as well, and prevents the ever-repeating need to reorganize. I just keep one nightstand with my current interests and favorites, and periodically feel a similar enjoyment organizing that instead of my entire library.